Solar Panels – Pope Power – Your local electrician based in Folkestone and covering the whole south east. Photovoltaic power generation employs solar panels comprising a number of cells containing a photovoltaic material. Due to the growing demand for renewable energy sources, the manufacturing of solar cells and photovoltaic arrays has advanced considerably in recent years. As of 2010, solar photo-voltaics generate electricity in more than 100 countries worldwide and, is the fastest growing power-generation technology in the world. Installations may be ground-mounted (and sometimes integrated with farming and grazing) or built into the roof or walls of a building, known as Building Integrated Photovoltaics or BIPV for short. Motivated by advances in technology and increases in manufacturing scale and sophistication, the cost of photo-voltaics has declined steadily since the first cells were manufactured. The photovoltaic effect is the creation of a voltage (or an electric current) in a material upon exposure to light. Though the photovoltaic effect is directly related to the photoelectric effect, the two processes are different and should be distinguished. In the photoelectric effect, electrons are ejected from a material’s surface upon exposure to radiation of sufficient energy. The photovoltaic effect is different in that the generated electrons are transferred between different bands (i.e. from the valence to conduction bands) within the material, resulting in the buildup of a voltage between two electrodes. 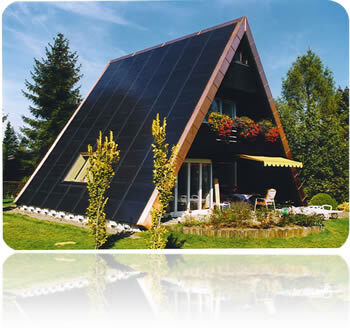 In most photovoltaic applications the radiation is sunlight and for this reason the devices are known as solar cells. The photovoltaic effect was first observed by Alexandre-Edmond Becquerel in 1839. Photo-voltaics are best known as a method for generating electric power by using solar cells to convert energy from the suninto electricity. The photovoltaic effect refers to photons of light knocking electrons into a higher state of energy to create electricity. The term photovoltaic denotes the unbiased operating mode of a photodiode in which current through the device is entirely due to the transduced light energy. Virtually all photovoltaic devices are some type of photodiode. Solar cells produce direct current electricity from sun light, which can be used to power equipment or to recharge a battery. The first practical application of photovoltaics was to power orbiting satellites and other spacecraft, but today the majority ofphotovoltaic modules are used for grid connected power generation. In this case an inverter is required to convert the DC to AC. When more power is required than a single cell can deliver, cells are electrically connected together to form photovoltaic modules, or solar panels. For a house or a power plant the modules must be arranged in multiples as arrays. Although the selling price of modules is still too high to compete with grid electricity in most places, significant financial incentives in Japan and then Germany, Italy, Greece and France triggered a huge growth in demand, followed quickly by production. A significant market has emerged in off-grid locations for solar-power-charged storage-battery based solutions. These often provide the only electricity available. 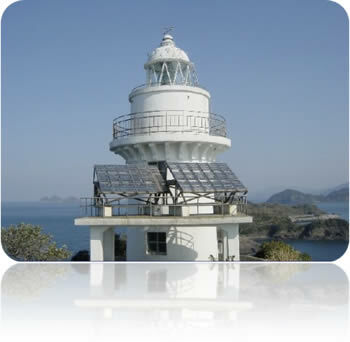 The first commercial installation of this kind was in 1966 on Ogami Island in Japan to convert the Ogami Lighthouse from gas powered-torch to fully self-sufficient electrical power. making it the world’s fastest-growing energy technology. By the end of 2010, the cumulative global PV installations surpassed 21,000 megawatts. Germany installed a record 3,800 MW of solar PV in 2009; in contrast, the US installed about 500 MW in 2009. The previous record, 2,600 MW, was set by Spain in 2008. Germany was also the fastest growing major PV market in the world from 2006 to 2007 industry observers speculate that Germany could install more than 4,500 MW in 2010. In 2006 investors began offering free solar panel installation in return for a 25 year contract, or Power Purchase Agreement, to purchase electricity at a fixed price, normally set at or below current electric rates. 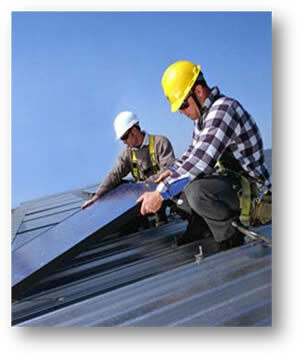 It is expected that by 2011 over 90% of commercial photovoltaics installed in the United States will be installed using a power purchase agreement. The current market leader in solar panel efficiency (measured by energy conversion ratio) is Sun-Power, a San Jose based company. Sun-Power’s cells have a conversion ratio of 24.2%, well above the market average of 12–18%. However, advances past this efficiency mark are being pursued in academia and R&D labs with efficiencies of 42% achieved at the University of Delaware in conjunction with DuPont by means of concentration of light. Photovoltaic arrays are often associated with buildings – either integrated into them, mounted on them or mounted nearby on the ground. Arrays are most often retrofitted into existing buildings, usually mounted on top of the existing roof structure or on the existing walls. Alternatively, an array can be located separately from the building but connected by cable to supply power for the building. Building-integrated photovoltaics (BIPV) are increasingly incorporated into new domestic and industrial buildings as a principal or ancillary source of electrical power. Typically, an array is incorporated into the roof or walls of a building. Roof tiles with integrated PV cells are also common. 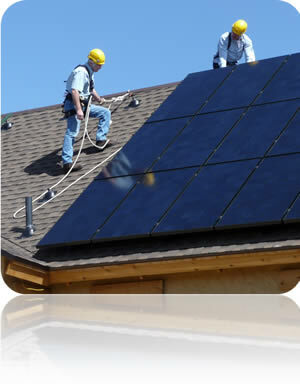 Photovoltaics are costly to install. While the modules are often guaranteed for 20 years, much of the investment in a home-mounted system may be lost if the home-owner moves and the buyer puts less value on the system than the seller. Solar electricity is not produced at night and is much reduced in cloudy conditions. Therefore, a storage or complementary power system is required. Solar electricity production depends on the limited power density of the location. Average daily output of a flat plate collector at optimum latitude tilt in the UK is 2–4 kilowatt·h/m² , and on average slightly higher in Southern Europe. The UK is committed to delivering its share of the EU target for 20% of energy from renewable sources by 2020. Achieving those targets could provide £100 billion worth of investment opportunities and up to half a million jobs in the renewable energy sector by 2020. It is clear that 50% of all our energy is used for heating and hot water and 75% of domestic households’ energy consumption is for heating and hot water. The UK’s renewable energy strategy aims for 12% of heat to come from renewable sources. Currently under 5% of UK electricity comes from renewable sources. It is estimated that 30% of our electricity may be delivered from renewables with 2% from small-scale electricity generation. How does the MCS affect installers ? 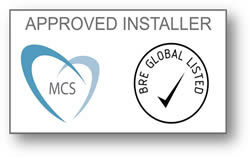 The MCS is an internationally recognised quality assurance scheme which demonstrates to customers that your company is committed to meeting rigorous and tested standards. Similar to the Gas Safe Register, the MCS gives you a mark of competency and demonstrates to your customers that you can install to the highest quality every time. 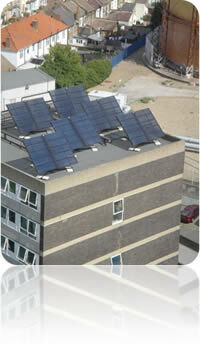 The City & Guilds Photovoltaic Qualification is called the…. Although this course may be difficult to find being run locally , when it is run by Colleges or Training Centres this qualification will allow candidates to be recognised as competent in this new field and play a vital role in the use of renewable energy. We at DJT have run many Sustainable Energy Seminars &Courses, that cover all aspects of sustainable energies, and may in time run the C&G 2372, however at present to demand does not quite equal the set up cost – as is the case with many Training centres. The qualifications cover a range of competences in fitting, installing and testing the system components. The content covers health and safety,knowledge of regulations, PV systems and components, roofing,commissioning, testing and customer care. Solar PV courses are intended for qualified electricians who will be required to install grid connected domestic photovoltaic systems that are either integrated into, or retro onto, a domestic dwelling. It is concerned with domestic systems installation within prescribed specifications and therefore does not cover design or glazed or curtain wall systems. It is expected that candidates entering into these qualifications will be practising electricians and have appropriate qualifications related to electrical installation, knowledge of the IEE Wiring Regulations and an Inspection and Testing qualification. The award is designed to offer specific skills and knowledge to electricians to ensure they are conversant with Regulations and Code of Practice related to PV systems. The Department of Trade and Industry (DTI) supports the recognition of personnel qualified to 2372 standards within this initiative and sees PV systems as an essential part of Government energy policy MCS. This award is made of two units. The first unit describes the underpinning knowledge that is required to understand the theory behind PV systems, related Regulations, safety requirements and installation and testing. The second unit is concerned with the application of practical skills in carrying out installation and testing. For the awarding of a City & Guilds certificate candidates must successfully complete both assessments. Knowledge of photovoltaic systems Written paper of 20 short answer questions and 1 long answer question 1 ½ hours.